Hi, I'm a "newbie" I have been looking at your post & learning from them for a while. Thank for the good info. I'm looking at a TD340 crawler with a bad motor, What can I expect to get into with this? What is it worth as is they says it's U/C is good not sure about clutches, ect. Will any other motor fit/work in this other than the D-168? if so are they available and at what cost? Thank you for any info. Interests:Engines from TITANs to TURBO diesels. McCormick-Deering & McCormick standard tread tractors. 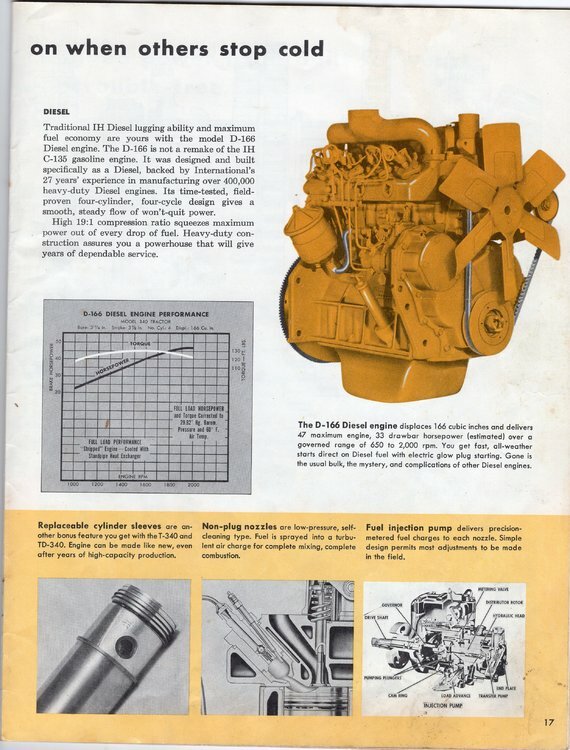 The D-166 ( not D-168) engine is a bit of an oddity, it was only used in the TD-340 crawler and 340 Series farm tractors. Endurance Power Products Inc.(google them) claim to have parts for that engine. continental red seal or something like them that will work. but thanks for your help. Tuscarora trader: Thank you, for your help. Where would be a good place to look for d166 engines? Also I'm told that the d166 was the precursor to the d188 motor. Will the d188 fit/work in the td340 dozers?? The IH D166 used in the TD340 was built by International Harvester, not Komatsu. I rebuilt a TD-340 with a D-166 several years ago. they are a bit different from the D-188 but may swap - I always wanted to try that but I was able to get all the parts I needed to just overhaul the one I had. Mine also threw a rod thru the block. The rod missed the oil supply galley and just popped a hole thru the web. I welded a cast iron patch into it and painted the inside with glyptol to seal any minute cracks. I found a replacement rod and had the crankshaft welded up and turned (all to 0.020") parts are still available I got most of mine on eBAY but that seems to have gone to the wayside. watch for cracks in the heads around injector ports and valves. injectors and pumps are relatively easy to repair/find. Mine runs great I warm mine up easy and cool it down for a long time - all in hopes to reduce wear and keep parts from cracking. My D-188 is in a backhoe and is a great little engine. best thing to do is go to binder books and get a TD-340, T-340, 340, 504 or 2504 tractor parts, maintenance and operating manual. each engine has variants and serials and you can readily find interchange parts at least by part number. keep in mind some parts will swap but may not be the same part # because of a nuance. I made my own radiator mounts for both the early and late version of mountings - let me know if you want some and I can make some as I saved the molds and the parts. they are a bit expensive cause of materials but its easier than changing the radiator or shell mounting system. I modified a new IH2504 aftermarket radiator to fit with a little modification to it. the radiator is really nice brass and solder unit - will last my lifetime. I also have an old series C-135 gas engine that I completely rebuilt. had cracks in the engine block on the cooling web. if I had to do again I would have swapped in a later version as the parts are stronger and more readily available. i probably spent more on that on gas engine than on the two diesel overhauls. like i said, i would really look into later model C-135 engines. I opted out of swapping a gas for a diesel as the extra items needed to fit into the machines. I put a paper element air cleaner onto my T-340 using a D-188 intake system (almost the same as a D-166) to keep filter stores down as I dont like oil bath cleaners. I like the little dozers - they pack a punch for their size (10k with drott) and the additional tooling isnt much bigger than typical stuff. and if you get them stuck or the need towing/transporting you dont need to mortgage the house to rescue them. I keep my machines all in the 40-50 hp range so I can bail out one with the other. hope this helps - let me know if you have questions and maybe I can help- good luck!!! Kevin: thank you ever so much for your great info. do you have any idea what the parts and labor cost were to repair the D-166 engine??? I know that was some time ago, but I don't want to get into a money pit!! Thanks again for your help..
OHHH - the cost. so i think it may be like mother's not being able to recall the pain of childbirth.....i could go try to find all the receipts and stuff but to be honest - i really dont want to know! the figures below are a guess/best recollection. I didnt want to do it and then risk all of it by skimping on a cheap part. i think the overhaul could be done for way less depending upon what you wan tint he end. maybe the head is OK and valves only need lapped - that would be significant savings. if the injectors and pump are good that would also be a significant savings. make sure you get a new injector pump umbrella seal set, new flywheel input bearing, clutch throw out bearing - as these types of things are inexpensive compared to the labor to replace after everything is assembled. the head was cracked and i got a repaired head for 450$ I think valves and guides were 25$ X 8 i got new springs and retainers 10$ each? have the block, crank and head checked for cracks at competent shop. new connecting rod bolts and nuts are a MUST! I think those were 15$ a piece. when I overhauled my C-135 (low serial number) they wanted 60$ a piece!!!! new clutch disk was 75$ and i didnt need to resurface flywheel. I used all new fasteners on rotating components. there is also more than just part cost. you'll want to make or get a nice puller for the piston sleeves (they are dry sleeves) and dry ice to put the new ones in. SO before you get depressed - - find out what was "bad" and go from there YOU MAY NOT NEED THE FULL MONTY!! these engines do have a reputation for throwing rods - so no matter what you do get new rod bolts. however maybe the pistons, liners, heads are all good and you dont need to replace them. maybe the injector pump is mis-timed and it just wont fire and you dont need those overhauled. maybe its just the injector pump that needs overhaul - those are very simple and relatively common. maybe it got water down the exhaust and you only need to change out one cylinder and valve set. If you do get the machine and determine the cost to repair, you'll still be able to part it out and recoup some or possibly make your $$ back. feel free to PM me or email if you want to discuss. Thank you for the info. the price sounds a bit to good to be true. Although it's been posted for about 40 days. I'll give him a call. he put up pictures so i assume its still for sale.